A curious blend of racing and live-action footage. When Amazon announced its Grand Tour video game, I imagined a generic racer with crudely digitized versions of Jeremy Clarkson, Richard Hammond and James May. The reality, though, is quite different. Amazon Game Studios is developing a title that, in many ways, is a perfect mirror of the Prime-exclusive show. The real-world antics portrayed in the TV series are more than loose inspiration -- they're the template for every race and mission in the game. Unlike Gran Turismo and Forza Motorsport, The Grand Tour Game will be an episodic series. You'll buy the lot as a set -- none of the episodes will be available individually -- and they'll be released on a weekly basis, just like the TV show. Ideally, then, the first instalment of the game will coincide with the season three premiere on Amazon Prime, and match each episode thereafter. "If you buy it early on, you'll get the new episodes as they come out," Brian Lindley, the game's senior producer explained. "[If] you buy it later, you'll just get all of the content at once, because it's already been released." The team, made up of former Burnout and Need for Speed developers, is aiming to make every race, review and prank of the show playable. Episodes will be broken down into chapters that are bookended with footage straight from the TV show. If Clarkson is reviewing a car, for instance, you'll watch his opening remarks and then take control of the vehicle in-game. As you fly around hairpin bends, the game will deliver a mixture of original voicework and commentary ripped from the TV episode. When you cross the finish line, the game might flip back into live-action footage to wrap up the segment. It's a unique approach. Plenty of games, including Quantum Break, have experimented with hybrid games that combine interactivity with live-action drama. The 2015 reboot of Need for Speed, for instance, used full motion video (FMV) for all of its cinematics. Oftentimes, though, these scenes come off as hammy or underdeveloped. In theory, The Grand Tour Game should avoid this problem because it's based on a show that -- in the eyes of fans, anyway -- is high quality. If you dislike the series, however, or have recently watched the corresponding episode, you can hit a bumper button and jump ahead to the gameplay portions. "We cut it down so that you get the flavor of the cars and you get the context of what you're doing with those cars. But you don't have to rewatch everything," Lindley said. At Gamescom 2018, I was able to play a smattering of segments pulled from the first episode. These included a lap around the show's 'Eboladrome' test track in a BMW M2, driven by Clarkson. Later, I completed a time trial event in a ferocious hypercar piloted by Hammond. The cars and tracks, while adequately detailed, were nowhere near the standard of Gran Turismo Sport and Forza Motorsport 6. The handling was fine, too, provided you prefer the arcade feel of games like Burnout and Need for Speed. The hypercar was trickier to control, but still a cinch compared to the equivalent vehicle in something like Project Cars 2. The unremarkable driving is buoyed by the personality of The Grand Tour show (provided you like its brand of entertainment, of course.) Amazon promises to emulate most, if not all of the "extreme" challenges that are presented in each show, as well as the presenters' unique brand of humour. During a split-screen multiplayer session, for instance, I was able to pick up coins that granted my car "more horsepowers" -- a temporary speed boost -- and 'texting,' which filled the screen of nearby opponents with irritating messages. The first time someone used texting on me, I flipped my car and triggered a light-hearted scream from Hammond. 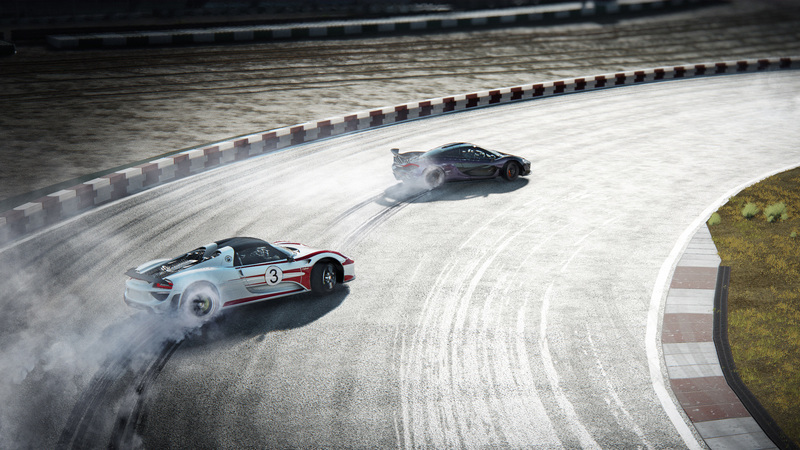 At times, the game felt more like Mario Kart than Driveclub. That's probably by design. The Grand Tour Game is accessible and, I suspect, designed for people who watch the show and appreciate car culture, but don't take games too seriously. The project is a huge experiment. Nobody has made an episodic racer before -- never mind one that matches the schedule of the TV show it's inspired by. It could be a huge success, or flop spectacularly when it arrives later this year on both the PlayStation 4 and Xbox One. The deciding factor, I suspect, will be the price. If it's cheap, the game's episodic nature and bombastic set pieces could tempt casual Prime subscribers and racing game enthusiasts alike.